ONE OF THE THINGS I LOVE MOST ABOUT CONTEMPORARY PERFORMANCE IS THAT IT GETS ME OUT AND ABOUT TO PLACES THAT I MIGHT NOT OTHERWISE GO. GATHERING GROUND, FOR INSTANCE, TOOK ME TO THE BLOCK IN REDFERN, MARALINGA [RT77, P46] TO THE ETTALONG WAR MEMORIAL CLUB AND FAST CARS AND TRACTOR ENGINES [RT70, P41] TO THE BANKSTOWN TOWN HALL. TONIGHT I AM ON THE M5 DRIVING TO MINTO, IN SYDNEY’S SOUTH-WEST, HOME TO THE RUGBY LEAGUE TALENTS OF JARRYD HAYNE, KRISNAN INU AND ISRAEL FOLAU AS WELL AS THE POLITICAL TALENTS OF WHITLAM, LATHAM AND NOW LAURIE FERGUSON. Fifty kilometres from the CBD, Minto is a world away from shiny, shiny Sydney: geographically isolated and economically disadvantaged. Nevertheless, it is currently undergoing rapid transformation, as Campbelltown’s Live Art Curator Rosie Dennis told Gail Priest in her interview in RealTime (RT100, p5)—public housing is moving out and private investment is moving in. Though it was not necessarily conceived as such, Minto:Live has become a part of this process of economic, social and cultural renewal. The project started in November 2010 when Dennis and several other artists literally set up shop in the Minto Mall. When curious residents came in, they found a range of activities on offer, including dancing with Lone Twin and Julie-Anne Long, crocheting with Nicole Barakat and publishing with Mickie Quick and Kernow Craig, all of which were to have performance outcomes of some description. Tonight, the final of three performances, is about sharing those outcomes. It’s six o’clock and a crowd is milling in the mall car park. Volunteers hand out programs and a man in a cycle rickshaw distributes envelopes labelled “MINTO THE TYPEFACE.” Inside are postcards telling stories that Quick and Craig have collected from Minto residents. The stories are small, but the cards are large—handy in the heat, if you need a fan. Fanning a fire in front of Tyrepower, is Uncle Ivan Wellington. He carries the ceremonial smoking leaves slowly and carefully through the crowd. The smell seeps into our clothing. Then it’s time for Sweet Tonic—a choir of senior citizens—who sing three songs, including John Williamson’s “A Thousand Feet Have Been Through Here.” Walking across the asphalt to a concrete ramp, we spy a council worker in an orange vest slowly circling his hips—this is Street Dance. Facilitated by UK performance duo Lone Twin with Campbelltown Arts Centre dance curator Julie-Anne Long, Street Dance features eight Minto households (13 people in total) dancing not only in the street but also in their front yards and favourite parks. In the opening dance, Ivan pitches his shoulder as if digging a hole, before stomping on the earth and jumping up a ramp. Standing at the top is Judi, whose dance is like semaphore without the flags. She and her two daughters stand still but move their arms with purpose and their wrists with delicate flicks. Up the stairs, Daryl is standing at the end of the cul de sac, rubbing his hands, half in anticipation, half in purification it seems. He extends an arm as if to hail a bus, offers his hand for a handshake and pats his pockets as he searches for his keys. Further along, a family of four puts on a Bollywood special in their front yard: two little girls in gold bounce around the lawn, before their father and mother emerge from the house to enact a skit about drink driving. In the park across the road, a grandmother is walking around a large tree, kissing her fingertips and extending her arms. When a small girl joins her, they do another loop of the tree and then head off up the hill. From behind, the older woman looks like she is doing an elegant breaststroke while her granddaughter’s movements are more akin to a paddle. Next we stop by Kaye who does a dance of farewell (to planes) and welcome (she seems to want to share a secret). Around the corner Judi and her daughters turn on the car radio, boogie to “Crazy Little Thing Called Love,” jump into the Nissan and roll off into the night. Finally, at the end of the street Chris and Kiara do the washing—shaking and folding invisible sheets. Street Dance works with a subtle and complex combination of the familiar and the strange: on the one hand, creating a choreography of every day gestures, on the other, reminding us that the nature of our day depends on gender as well as geographical and social location. Similarly, though it could be described as an attempt to make the suburban strange, it also has the opposite effect, making me realise that suburbs are strange enough, with their stamped concrete and security cameras. In these moments, Street Dance actually works to make these Truman Show streets feel slightly less surreal—like an ordinary place to play and perhaps dance. Following Street Dance, we head to another park, where three women sit in armchairs working on Barakat’s Common Threads. One sits with a pile of old rags making rope, which the others then use to crochet. The result is what one of them describes as a “string sculpture in action” and it looks like large doily. Further up the hill, we sit on picnic blankets and listen to the sounds of nine trumpets. TrumpetSWest’s first piece is slow, sweeping and sombre while the second is jauntier, as the lead player meanders in front of the melody. The longest contribution to Minto:Live and the one most self-consciously framed as a performance (set in a natural amphitheatre, staged on a blue mat) is Hetain Patel’s Ten. The show alternates between storytelling, music and movement, as Patel talks about being born in England to Indian parents. Formerly embarrassed by his background, he has since come to embrace it and, in an effort to become more connected to Indian culture, taken up the tabla drums. This segues into the musical sections, where he and his two local collaborators (Nikki-Tala Tuiala Talaloloa and Charlie Fruean) clap out complicated 10-beat rhythms. Talaloloa then offers a Samoan slap dance and Fruean a Maori haka in return. In the final third of the show, the men start to borrow verbal and physical phrases from each other so that Patel performs a haka and Talaloloa, in his gently clipped vowels, talks about mixing red paint. Ten is an elegant and interesting piece, if slightly too long, particularly for neighbourhood children who are busy bobbing about, disrupting the audience’s sight lines and thus reasserting the community aspect of the event over its performativity. Perhaps they are anticipating the wheelbarrows full of ice cream further down the hill, where three large video screens play the Minto Waterhole, a film created by Class 3/4J at Sarah Redfern Primary School with the help of Howard Matthew, Caitlin Newton-Broad and Sanjay Hona. The film is an endearing mix of live action and animation, which depicts a secret water world full of puppet creatures, lurking somewhere below Minto—a magical thought on this hot summer night. Minto:Live concludes with a smoking ceremony of another kind: Gwendoline Robin’s Instant No.6899. Dressed in what looks like a white space suit strapped with explosives, Robin slowly puts on her helmet and wraps silver tape around her neck. The anticipation is almost too much for the children behind me, who think she might be a suicide bomber. 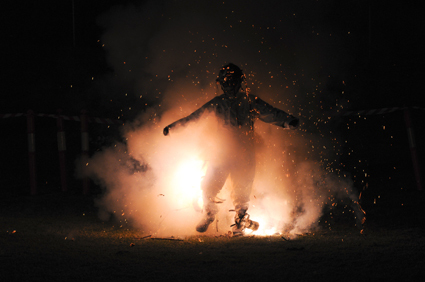 She lights a fuse and then her suit explodes, setting off small grass fires. “She’s dead!” the children cry, but then as Robin walks down the hill with a stream of smoke in her wake, they revise this to “She’s the walking dead! She’s a zombie! She’s on fire, she’s a fire zombie!” This stream of images is itself one of the evening’s many small pleasures and as we walk back towards the mall, we smile with the knowledge that Minto is teeming with imagination.